FOR THE LAST two years, the gangland feud between the Kinahan cartel and the Hutch gang has been fought on the streets of Dublin, Meath, Spain and the Netherlands. Fourteen people have been murdered – some like Martin O’Rourke and Trevor O’Neill were killed because they were in the wrong place at the wrong time, shot in two separate cases of mistaken identity. Others such as Eddie Hutch Snr and Noel Duggan were killed as they were seen as ‘soft‘ targets. 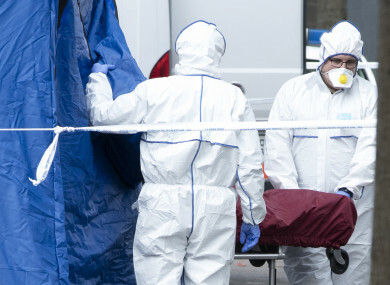 Elite gardaí have stopped around 50 incidents where they believed people were about to commit a murder on behalf of one or other of the crime syndicates. Loaded machine guns, handguns, revolvers, grenades, tonnes of cocaine, heroin, cannabis and laundered cash have been removed from the streets in the two years since the murder of Gary Hutch in Spain sparked the gang war raging today. But now the modus operandi of the cartel and the Hutch gang is evolving. Graffiti messages are still daubed on the walls near where their rivals live – most outing people as supposed informants, others threatening to kill gang members. Instead of using spray paint on walls, alleged associates of both gangs are now believed to be using social media to spread information against their rivals. Dozens of accounts have sprung up on Twitter in the last six months, many following crime reporters, others just tweeting their own conspiracy theories about what happened at the Regency Hotel the day David Byrne was shot dead. At least three people have fled the jurisdiction since these accounts sprung up. One man in particular, who gardaí believe was behind the murder of Eddie Hutch Snr in Poplar Row, Dublin 1, in 2016, was brought into garda custody for his own protection after a number of tweets outed him as being an informant. The real identities of those behind the anonymous accounts are a thing of rumour and discussion among journalists and gardaí. Some believe the accounts are being directed by high-ranking members of the gangs. Others think more web-savvy members of the gangs are behind the accounts, the content of the messages decided by gang lieutenants. According to one well-informed source, these Twitter accounts are “trying to get people killed. That’s their only purpose”. While the follower counts of these social media are relatively small, gardaí have taken a serious interest in around a dozen active profiles. Some have detailed knowledge of ongoing criminal investigations leading gardaí to believe that they are not random people masquerading as criminals. However, gardaí have discounted a number of Twitter accounts purporting to be involved in the gangland feud. Gardaí suspect that around 10 accounts are being run by the same person and are not in any way connected to the feud. That person has come to garda attention a number of times before. TheJournal.ie contacted Twitter for comment and while it said it could not comment on this specific case, it said that it does occasionally liaise with police forces. Twitter regularly supports law enforcement entities and has a dedicated team for dealing with official legal requests. Its reporting procedure for policing and justice organisations can be found here and it also tracks requests in its Transparency Report. Email “'They're trying to get people killed': The gangland feud has now spread to Twitter”. Feedback on “'They're trying to get people killed': The gangland feud has now spread to Twitter”.